Expired 3mo ago . Last validated 3mo ago . Used 1 time. @ShoppahDealz Tested this promo code and verified that it works as described. Exclusions apply. 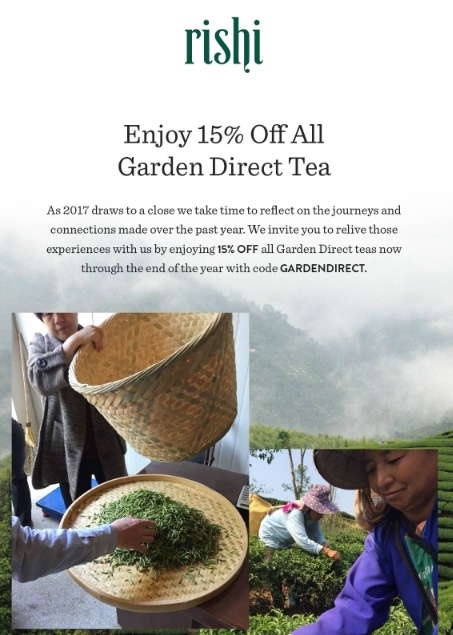 Sonico 15% off promotion valid only with code GARDENDIRECT. Promotion ends midnight CST Sunday, December 31, 2017. Valid for rishi-tea.com ecommerce customers only. Promotion cannot be applied to multiple orders or past orders. Promotion cannot be used in combination with other promotions. Cannot be applied to the purchase of gift cards. Other restrictions may apply.